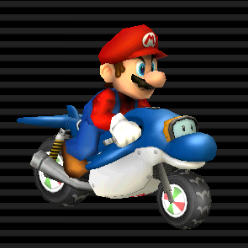 The Dolphin Dasher is an unlockable medium-sized bike in the game Mario Kart Wii. It is unlocked by winning the Mirror Star Cup. As the name suggests, it resembles the Dolphins from Super Mario World. The character's emblem is shown on the bike's belly. Its kart counterpart is the Super Blooper, which is slightly faster and lighter, making the Dolphin Dasher the only bike heavier than its kart counterpart. The arcade title, Mario Kart Arcade GP DX, features a kart that is similar to the Dolphin Dasher, dubbed the Turbo Dolphin. The Dolphin Dasher has a great off-road stat, which is tied with that of the large bike Phantom. Unlike the Magikruiser, it loses a little more speed when going off-road. Compared to the Zip Zip, the Dolphin Dasher has more speed and weight, but has less acceleration, handling, drift, off-road, and mini-turbo. It is noted for being the heaviest medium bike in the game, along with having the weakest drifting among all the inside drifting bikes. The Dolphin Dasher shares the same speed and handling stats as the Jet Bubble. The two vehicles also have the same mini-turbo stat. The Dolphin Dasher also features the same weight as the Classic Dragster. Diddy Kong, riding his Dolphin Dasher at Bowser Castle 3. "If cute was a category, the Dolphin Dasher would be in the top spot. Instead, its Off-Road capabilities are really its best attribute. Just don't try to get too fancy with drifting—you might run into something or even roll 'er!" French (NOA) Coryphène The French name of the fish, Mahi-mahi, also known as the "dolphinfish". This is one of the vehicles, along with the Classic Dragster, Daytripper, Cheep Charger, and the Honeycoupe, that has a color scheme based on the traditional colors from the rainbow and it is the only one of those that is a bike. The tires on this bike feature a "wavy" design also found on the Cheep Charger and Super Blooper. The wheels inside the tires have beach ball-like patterns. These vehicles are all based on aquatic Mario series enemies. Mario's Dolphin Dasher has the color scheme of an actual Dolphin from Super Mario World. This is thus the only vehicle not to have a red color scheme for Mario, which is used by Diddy Kong in this case instead of his usual brown. All other drivers have different color schemes of their own. If Mario or Luigi ride the Dolphin Dasher, its weight can surpass that of the Sprinter's and Shooting Star's by one point. This page was last edited on March 4, 2019, at 17:50.